ab45838 Human TPH2 peptide can be used as a blocking peptide for ab40846. Our Abpromise guarantee covers the use of ab40846 in the following tested applications. IHC-P Use a concentration of 4 - 6 µg/ml. Perform heat mediated antigen retrieval with citrate buffer pH 6 before commencing with IHC staining protocol. 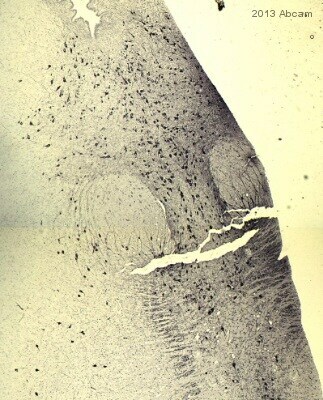 In paraffin embedded Human Brain Stem shows layered neuronal staining. Aromatic compound metabolism; serotonin biosynthesis; serotonin from L-tryptophan: step 1/2. Genetic variation in TPH2 may influence susceptibility to major depressive disorder (MDD) [MIM:608516]. Defects in TPH2 are the cause of susceptibility to attention deficit-hyperactivity disorder type 7 (ADHD7) [MIM:613003]. ADHD is a neurobehavioral developmental disorder and is primarily characterized by the co-existence of attentional problems and hyperactivity, with each behavior occurring infrequently alone. Note=Naturally occurring variants of TPH2 with impaired enzyme activity could cause deficiency of serotonin production and result in an increased risk of developing behavioral disorders. ab40846 at 4 µg/ml staining TPH2 in human brain stem by Immunohistochemistry (Formalin/PFA-fixed paraffin-embedded sections). Steamed antigen retrieval with citrate buffer pH 6.0 was perfomed. Antibody detected by HRP-staining. Publishing research using ab40846? Please let us know so that we can cite the reference in this datasheet. I would like to test ab40846 for use on baboon samples. I am very pleased to hear you would like to accept our offer and test ab40846 in baboon. This code will give you *** off your next order before the expiration date. To redeem this offer, please submit an Abreview for baboon and include this code in the “Additional Comments” section so we know the Abreview is for this promotion. Please remember that submission of the Abreview is sufficient for the discount code to become active.